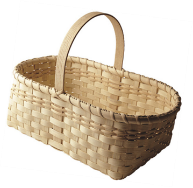 Join June Puett to learn how to weave a market basket with a handle using reed. These are beautiful and useful baskets. Plus, they make great gifts. This class is appropriate for beginning, intermediate, and advanced weavers. The heritage skill technique taught during the class can be used to make a variety of basket styles.